Izari´s rich, subtle-textured wenge gives a premium feel. This is a kitchen for true lovers of design. It's not all about aesthetics though. 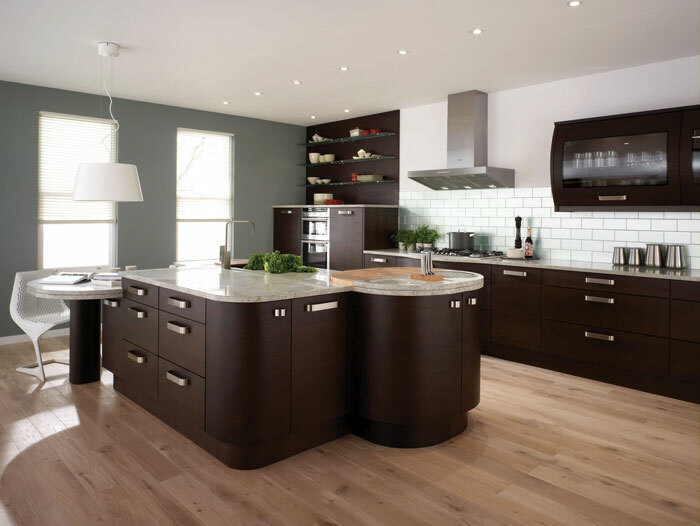 The curved units not only create a dramatic focal point, they're very ergonomic to work around. The island is full of functional features, including a built-in knife block, butcher´s block and bin on the preparation space, as well as plenty of storage and a lower-level seating area. A mid-level height unit next to the hob gives you the option of built-in, higher-level appliances or larder storage. While the unusual, curved wall units are another example of Izari's design-conscious detailing.